InnovaPharm is a new supplement brand run by industry veterans who were tired of "playing it safe". Read about the aggressive InnovaPharm supplements! Joint Repair & Pain Relief! Joint Repair & Pain Relief!Joint Repair & Pain Relief! 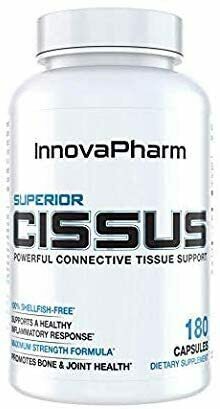 Superior Cissus consists of a highly dosed engineered extract of Cissus Quadrangularis known as QuadraFlex (TM), standardized for both Ketosterones and Iridoids. This unique extract of the fully balanced herb promotes healing and combats inflammation by not only focusing on the herb's extremely high Ketosterone content but also on high levels of Iridoids which have noted anti-inflammatory benefits. By focusing on these specific constituents, while still protecting the proper balance of the whole herb, and by providing the highest dosing available, we have delivered a Cissus product that is SUPERIOR to all others. Delivering REAL results with an INNOVATIVE product.